Like so many articles, I began this a couple of months ago and got sidetracked. Although the news is now a bit dated, the principle remains extremely relevant, even timeless. This writing began when I read a column by CBN News political correspondent David Brady entitled Evangelical Leaders Say Donald Trump May Find Support from Social Conservatives. About ten days later, an article appeared in the Christian Post entitled Donald Trump on Faith: I am Christian, Sunday Church Person. Potential GOP presidential contender Donald Trump opened up about his faith during an interview with a Christian network, saying he is a Christian and that he's a "Sunday church person." When asked by Brody where he stores all the Bibles people send to him, Trump said that he keeps them in a "very nice place" since his Manhattan location doesn't allow him to keep all the mail he receives. "There's no way I would ever throw anything, to do anything negative to a Bible, so what we do is we keep all of the Bibles," said Trump. "I would have a fear of doing something other than very positive so actually I store them and keep them and sometimes give them away to other people." After this article came out, I heard many people say (often with an amazed expression), “I didn’t know that Donald Trump was a Christian.” To which I usually reply, “Neither did I… and I still don’t know”. I’m then often asked, “What makes you think he’s not?” In reply, I usually say something to the effect of, “I’m not saying that Mr Trump is not a Christian. I don’t know him personally so I’m only basing my thoughts on the news accounts, which provide very little evidence either way”. In examining Mr Trump’ statements, he first says “I believe in God”. To many people, we would ask “Which god?” but his additional comments leads us to believe he is indeed referring to the true God of the Bible. It is not clear how much, or how little he knows about God, but mere acceptance of His existence only qualifies one to be a demon (James 2:19). Mr Trump does state that “I am a Christian”, but merely making this statement only puts him in the same company as Barack Obama and over 80% of Americans who claim to be a Christian. When follow-up questions are asked (which evidently was not done in Mr Trump’s case), we find the number of possible true Christians drops by more than half. Pope Benedict XVI’s visit to the United States in April of 2008 was a turning point for me. The Holy Father presided over solemn vespers with the U.S. bishops in the Crypt Church at the basilica in Washington. Callista’s choir was asked to sing for Pope Benedict at vespers, and as a spouse, I had the unique opportunity to attend the papal visit and was deeply moved by the occasion. Catching a glimpse of Pope Benedict that day, I was struck by the happiness and peacefulness he exuded. The joyful and radiating presence of the Holy Father was a moment of confirmation about the many things I had been thinking and experiencing for several years. That evening I told Msgr. Rossi [Walter Rossi, rector of the basilica in DC] I wanted to be received into the Catholic Church, and he agreed to join Callista [Mr Gingrich’s third wife]as my sponsor. Under his tutelage, I studied the Catechism of the Church over the next year and was received into the Church in March of 2009 in a beautiful Mass at St. Joseph’s on Capitol Hill. Mr Gingrich’s article was primarily about his journey toward the Roman Catholic faith, but the timing suggests that it was also written for political gain (as was Mr Trump’s interview). Some have suggested that if Mr Gingrich had run into the equally peaceful and happy Dalai Llama, he might have become a Buddhist instead. We find this highly unlikely sine there aren’t 40-50 million Buddhist voters in our country. It remains to be seen if this article will help him to erase his divorce problems, since his 6-year extra-marital affair with Callista was a primary cause of the breakup of his second marriage. This all said, the primary objective of this two-part article is not to focus so much on Mr Trump and Mr Gingrich, but to caution Christians to be alert for false Christians. Before I go any further, let me say again that Mr Trump and Mr Gingrich may both be Christians, but we should be careful to assume this without evidence. Let me further say that, this is not written so that Christians can respond with condemnation, but so that we do not miss a witnessing opportunity. As we mentioned above, less than half of those professing to be Christians are actually saved. It is very sad that, upon their physical death, so many will hear Jesus say, “Depart from me, I never knew you” (Mt 7:23). Perhaps even sadder still is the fact that many of these lost people genuinely believed that they would go to heaven, and the saddest part of all is that, many true Christians might have missed witnessing to them because we also assumed that they were saved. The Scriptures tell us that only God can truly know the heart (Lk 16:15), but we can also know blatantly false Christians (Mt 7:20, Titus 1:16) by their actions. Unfortunately, the Bible also speaks of a more difficult case, that of those who are difficult to distinguish from true Christians (Jesus’ parable of the wheat and tares in Mt 13:24-28). So, we must be ever vigilant in our evangelism. We’ll get much deeper into this issue in Part 2. The link will be posted here when completed. 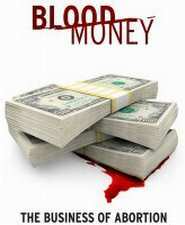 Bloodmoney is a documentary (now available on DVD) that exposes the greed-driven politics of the abortion industry. Despite claims that the pro-abortion movement exists to help women, in reality it is little more than a vast money-making enterprise. Narrated by Dr. Alveda King, the niece of Dr. Martin Luther King, this film exposes the truth behind an industry that has harmed untold numbers of people and taken the lives of 50 million innocent children. In the film Dr. King speaks not only from the perspective of a post abortive woman, but as a civil rights leader about the injustice of abortion. “Bloodmoney brings startling revelation to the forefront of the pro-life battle and exposes the true agenda behind the abortion industry. This film is truly part of the plan to set the captives free,” – Dr. Alveda King, director of African American Outreach, Priests for Life. The film also features interviews from Carol Everett a former abortion clinic owner, as well as from pro-life leaders such as Frank Pavone, Joe Scheidler and others. This documentary film examines abortion in America, from the inception of Planned Parenthood to Roe v. Wade and the denial of when life begins. The makers also look at the profitability of the abortion clinics that keep this barbaric practice going. Finally, it shows the devastating effects abortion can have on the women that have them, and the continuing fight to save the lives of innocent babies. The film also reveals many other closely guarded abortion industry secrets such as the racist agenda of Planned Parenthood, clinics performing abortions on non-pregnant women so they can still make money, first hand evidence of multiple doctors conspiring to cover up botched abortions to avoid law suits, and much more. The following is an excellent video of Carol Everett, former abortion provider and clinic operator, speaking about abortion in the film. We must be familiar with these facts and spread the news in order to help young women be able to make an informed decision in their time of crisis. I hope everyone had an excellent Independence Day weekend. We were blessed by an impromptu mini-family reunion. We were grilling, expecting my two brothers to visit along with our two sons, but had to make a last-minute run to the supermarket to accommodate about 20 aunts, uncles, nieces, nephews and friends. Our son Jeff took a break from his heavy workload and studies at SMU. Our other son Justin was home from California on his last leave before deploying back to Afghanistan with the US Marines. We were very thankful for the large turnout. A new Harvard University study finds that July 4th parades energize only Republicans, turn kids into Republicans, and help to boost the GOP turnout of adults on Election Day. “Fourth of July celebrations in the United States shape the nation's political landscape by forming beliefs and increasing participation, primarily in favor of the Republican Party,” said the report from Harvard. There is no evidence of an increased likelihood of identifying as a Democrat, indicating that Fourth of July shifts preferences to the right rather than increasing political polarization," the two wrote. The liberal professors then proceed to offer these so-called “three key findings”. It boosts the likelihood a reveler will vote by about 1 percent and increases the chances they'll make a political contribution by 3 percent. We found no documentation on how the professors arrived at these statistics, but I believe the report’s conclusion confuses the cause and effect of patriotism. The professors basically assume that people attending Independence Day parades are politically neutral until the parades turn some of them into right wing radicals. Since in their minds, it's probably difficult to imagine how any intelligent person can actually be loyal to a country like America, the parades must be the “cause” of people becoming patriotic and Republicans. We would argue however, that attendance at patriotic events is the “effect” of a person’s political, social and cultural inclination. That is, those people who are patriotic, Republicans, and conservatives (those recognizing the authority of the constitution) are much more likely to attend the Independence Day parades. Another “surprising discovery” in the report (at least to the liberal professors) is that the impact of the parades is not temporary, but permanent. The Harvard report stated “Surprisingly, the estimates show that the impact on political preferences is permanent, with no evidence of the effects depreciating as individuals become older”. This statement reinforces our conclusion, since liberals tend to be driven by emotion and feelings, so any patriotic impact would be short-lived. Now, we don't want this article to be a blanket criticism of all liberals (those who reject traditional authority). I have several very good friends who lean liberal on many issues, but also are very patriotic. For the most part however, many liberals are more at home on holidays such as Cinco de Mayo or others that promote foreign, international or global interests. The most radical are more comfortable at a “flag-burning” event than at a “flag-waving” one. This usually stems from the commonly held belief that American exceptionalism is the root of all evil and the source of the world’s problems. Thus, they feel guilty about our prosperity and freedom, and feel the need to apologize to the rest of the world rather than encouraging other countries to follow our model. 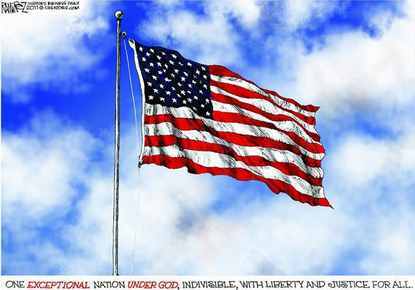 We will further investigate typical liberal attitudes toward our country in another post to be uploaded shortly and linked from here. We’ll close this article by noting that, religious conservatives recognize that we ultimately owe our freedoms to God rather than to a human source such as government. Any freedoms given by government can also be taken away by government. True freedoms come only from God.